Let’s face it. On premises system architectures have long been an enabler for both lazy and amateur enterprise architects. Need to move some data around? Simply add a couple of fields to store it. Need to add some integration just so we can see all of the data in a single place? Build some batch jobs to push data hither and yon – and replicate it in multiple places just to make it easy to get at. Nowhere is this more evident than in a Project Management Information System (PMIS) that has grown organically to the needs of the enterprise. Invariably, a PMIS has grown as a collection of disparate systems and silos, all oriented to the needs of a specific functional group that may be involved in the execution of a project. The integration eventually evolves into a veritable spaghetti diagram of lines moving data from one system to another. Often, the data schema for the scheduling tool is expanded or repurposed to collect all of the data into a single, convenient data repository. Generally speaking, this sort of works for many organizations. They still manage to get their work done, albeit with a fair bit of grumbling around project managers having to access multiple tools to get their jobs done. The main challenge with this tool architecture is that it doesn’t support a nimble process framework. As PM processes mature (pro-tip: they will) or adopt to the changing organization, the organization needs to maintain a strict focus on a capabilities infrastructure. As the capabilities develop in maturity, the underlying tools must also adopt, and this is where the traditional organic PMIS fails…..to a large extent due to the technical debt incurred in the evolution of the overall system. Traditionally, with on-premises systems, this tendency towards entropy is addressed every couple of years in the form of an upgrade. The vendor releases new versions of the software, and as part of the inevitable upgrade process, the organization performs a subbotnik to reassess and simplify the overall system. This cycle naturally prevents the overall system from getting too complex. Today’s subbotnik is not your father’s subbotnik however. Today, most of the discussions we have around upgrades involve a consideration of moving to the cloud. Often times, this is driven by the desire to take advantage of the cost savings that enterprise cloud offerings now bring to the table. Twice in a week, I’ve been in conversations with clients about how they could save significant infrastructure overhead costs through moving to the cloud – but have been prevented from doing so by the architecture of their existing PMIS. This means that they’ve been stuck with expensive on-premises environments with feature sets that grow increasingly outdated with each day. Furthermore, additional care must be taken when moving to the cloud as we will lose that convenient safety valve of reassessing the entire thing from the ground up as part of an upgrade within the next several years. Whatever we design today, we will have to live with tomorrow – and the day after tomorrow. Instead of pulling data backwards and forwards, we are consolidating it. 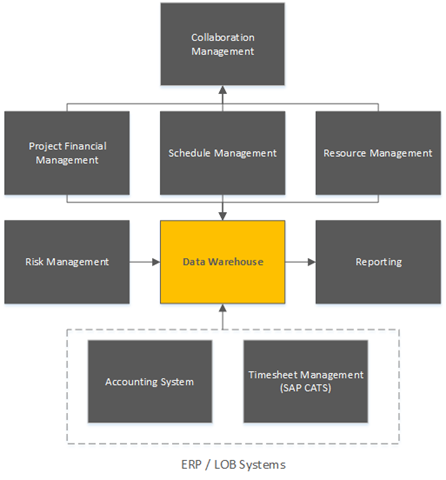 The data is either consolidated in real time with any number of reporting tools such as Microsoft Excel, PowerBI, Tableau or Spotfire…..or it’s being pulled into a data warehouse such as SQL or HANA using an ETL tool. Doing so greatly reduces the complexity of the overall system and allows each part to feed data in such a way that the company can rapidly mature in a specific capability as needed. Hence, for those organizations with a significant existing investment in on-premises PMIS and the associated integration that this usually entails, a cloud discussion almost always needs to start from the process discussion. What is your process? How do the tools you currently have enable this process? How do the tools we currently have block the process? 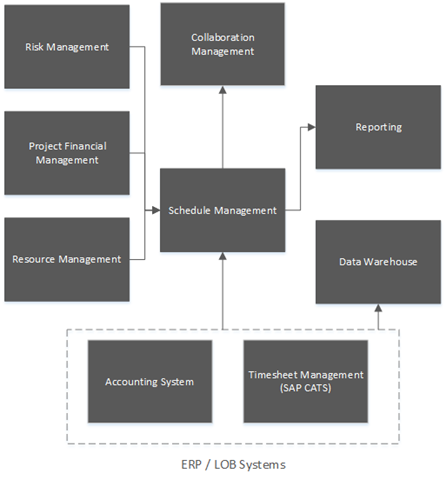 Does the process truly support the project management needs of the enterprise? It’s only after having this discussion, that a new system architecture may be designed…..one which enables the nimble enterprise. Here, we run into some of the typical challenges of a cloud discussion. Typically, the cloud agenda is part of the IT agenda – as a means of reducing operational costs associated with maintaining rooms full of big iron. The processes we are supporting are owned almost always by a PMO or PMOs. To have this discussion effectively, i.e. of how to move to the cloud, the PMOs must be engaged by IT to reassess process and ensure that the results can be moved to the cloud effectively and efficiently. One of the most useful things to surface in the latest Microsoft BI offerings is the Natural Language Query (NLQ) functionality inherent in the Power BI online offering. NLQ allows users to simply type questions into the interface to generate dynamic reports. The beauty of this is that it’s not limited to Project Online data – or even a single source of data. I can add multiple sources of data, create a data model and then go to town on asking questions of the data, literally. 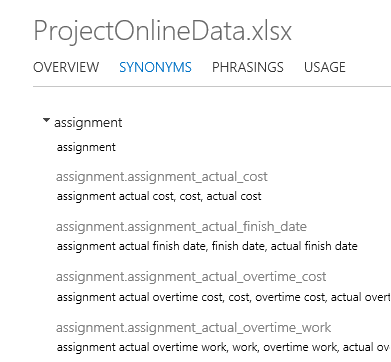 This post will walk you through how to get this up and running in Project Online. This assumes that as part of your Project Online tenant, you have at least one license for the Power BI offering. Creating the data source is relatively simple. Add an OData connection. In this case, I actually added a couple of tables (Project, Assignment, Resource). Feel free to check out prior blog posts on the topic here. Ensure the tables have relationships. Navigate to your PWA site and add the report to the Power BI app. This took a couple steps and some troubleshooting before I got it all working. The basic instructions can be found in the following three blog posts. 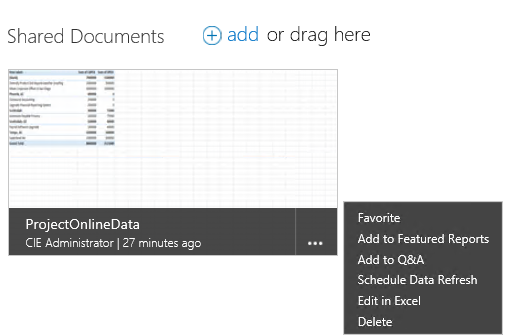 To check if the refresh is working, try refreshing the data connections in Excel Online. If that works, the scheduled refresh should work. Click on the ellipses next to the report, and add the report to Q&A. 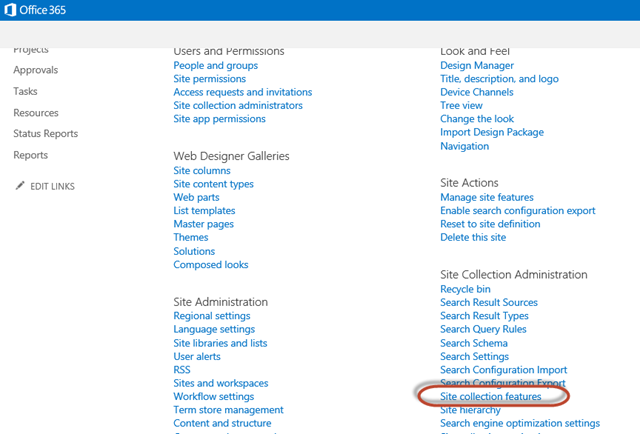 From there click on the Ask with Power BI Q&A in the top right of the page. Throw some queries into the search interface to confirm data is being returned. You may note that it’s showing the wrong fields by default, i.e. it’s showing the Project ID instead of the Project Name. We’ll take care of this in the next step. 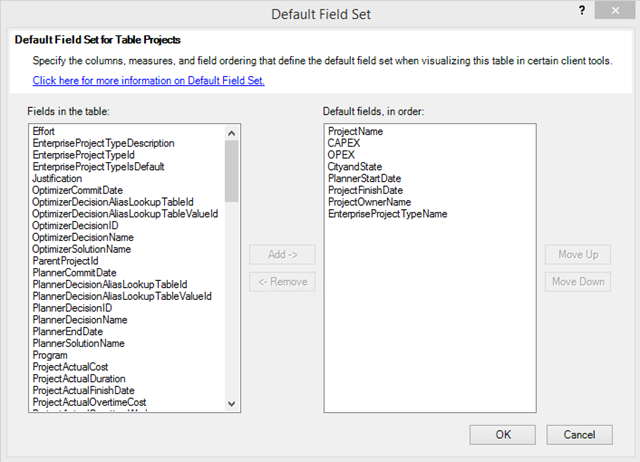 Open the data source in Excel again, and navigate to PowerPivot. You’ll see that you can right click on the column headers to select the option to Hide from Client Tools. The other thing you can do to train the language model is to change the default field set. You’ll see this option in the Advanced tab in PowerPivot. Luckily, there’s also a Web based option for training your Power BI model. 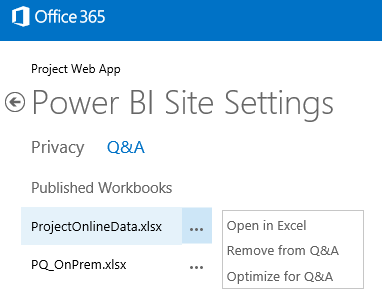 Buried in the Power BI Site Settings, underneath the Q&A tab, you get the option to Optimize for Q&A. That yields an interface to add synonyms and other key elements to help your users connect with their data. Add a link to Q&A onto your Project Web Access and feel free to fry all of your report developers’ squid. This question comes up on such a regular basis, that I decided to blog it up this weekend. What’s the difference between the business intelligence story in Project Online vs. Project Server 2013 On-Premises? To be honest, answering this question goes a long way to answering the question of what the difference is between Project Online and Project Server, period. The main difference is business intelligence. Project Online – the offering provided by Microsoft that’s really Project Server 2013 + whatever upgrades have happened in the Online product between when 2013 was released to market and the date of this blog post. (Watch the comments for updates). Project Server 2013 – well, Project Server 2013, as deployed on premises – again, assuming all of the updates as of this blog posting. Note that the reason I have to be careful about term definitions is that much of the v.Next functionality for Project Server on premises is being released right now in the online environment. I would expect many of these features to first appear online, then migrate over to the on-premises world – which will make this post outdated pretty soon. Before reading any further, feel free to check out some of my other blog posts on reporting options available both online and on-premises. Data Source – the underlying raw data related to projects, resources, etc. This data source may be real time, or for various reasons, replicated to a secondary data source using a timed process. Data Model – the relationships and hierarchy between the various data points. For example, I may have three resources assigned to a project that is supporting my drilling operations. That would necessitate pulling data from the resource table, assignment table, project table, and potentially additional tables related to workflow. Reporting Layer – the tools used to actually generate the reports. Presentation Layer – the platform used to surface the reports to the general users. Project Server stores everything in a set of tables within a SQL database. Hence, any reporting tool that can access SQL (which is pretty much all of them) can access and report on Project Server data. Project Online doesn’t allow direct access to SQL data, as the database instance is a shared environment, and thus, users could theoretically impact other tenants if they had direct access. For Online, the preferred reporting is OData, which is an RSS-like data feed. Open an OData compliant reporting tool (like Excel 2013), point it at the feed URL, and you have the data (albeit not the data model – which is a different story). As many clients still prefer to report against SQL, Microsoft has recently released (via Cumulative Update) an SSIS upgrade that will allow organizations to set up timed reporting jobs to import OData feeds into an on-premises SQL database – thus allowing the use/migration of existing reports that look for SQL data. The issue, of course, is that the SSIS integration reporting isn’t quite real time – or it’s a mix of real time and not-so-real time. Reports requiring a limited data set can pull from the live online OData. Reports requiring a lot of data, i.e. timesheet reporting, etc., can pull from the SQL database. The main caveat here is that if you’re the kind of organization that likes to generate reports, spot mistakes, republish projects, and regenerate reports, latent data may not work for you. If on the other hand, you feel the savings from going online offsets the issues with not having real time data, the the Online offering may be appropriate for you. Hence, we actually have three scenarios to compare. Note that these may not be mutually exclusive – as you can mix and match some of the functionality depending on your needs. You can also have hybrid online/on-prem environments if there’s something available in one that you absolutely need to support your organization. Data Feeds – configurable to integrate both on-premises and online data. 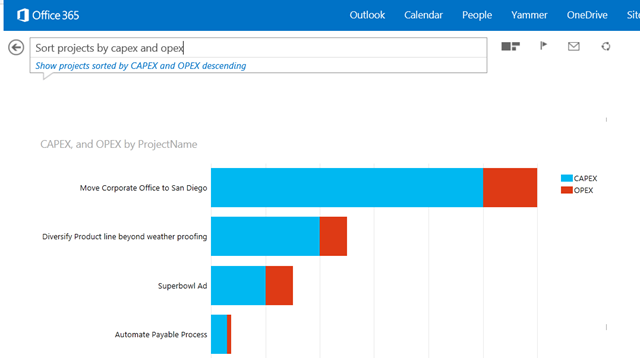 Power View reporting – similar to what’s available in SharePoint. Natural Language Querying – which is one of the more exciting things to be happening in the BI world, i.e. the ability to create data models and allow users to enter questions into the browser window – which the system answers. For example, you can type something like “Show me all projects starting in Botswana in 2015,” and the system will automatically spit out a map of Botswana showing the location of all projects starting in 2015. That’s the main round up of differences. Did I miss anything? Feel free to drop me a line in the comments section.